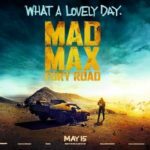 Starring James McAvoy, Emily Blunt, Johnny Depp, Chiwetel Ejiofor, Maggie Smith, Michael Caine, Mary J. Blige, Jamie Demetriou, Ashley Jensen and Matt Lucas. 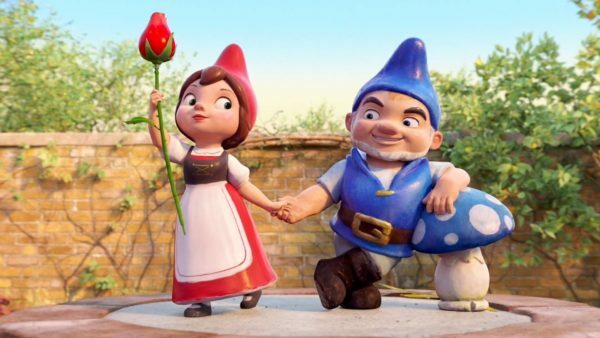 Does anybody really remember Gnomeo & Juliet? Released back in 2011, it was a strange story that adapted Shakespeare through the medium of talking garden gnomes and Elton John music. 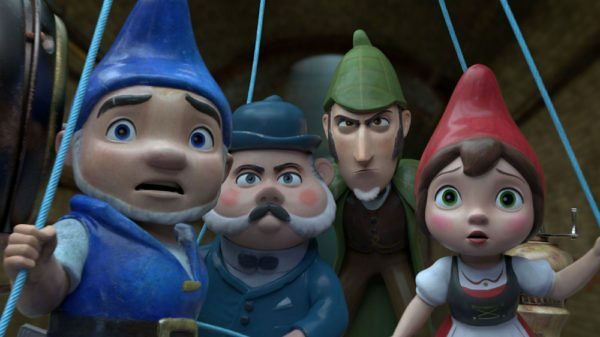 It’s not a movie that begged for a sequel and it has taken seven years to get there, but the garden ornaments are back and taking on Arthur Conan Doyle’s most iconic creation in Sherlock Gnomes, which is an enjoyable, rainbow-coloured adventure carried along on a strong current of slapstick and puns. Those wondering how Conan Doyle and Shakespeare can meet get their answer in an amusing prologue that sees tiny gnomes arguing about which story to tell next. After ‘Game of Gnomes’ and ‘The Gnome Ranger’ have been vetoed, they settle upon Sherlock Gnomes. The story reintroduces James McAvoy as Gnomeo and Emily Blunt as Juliet, who have now been anointed as leaders of the garden following their family’s relocation from quiet Warwickshire to the hustle and bustle of London. One day, their friends vanish and they are visited by Sherlock (Johnny Depp), who is investigating a spate of gnome disappearances. Depp’s take on Holmes is prim and arrogant, constantly alienating his put-upon partner Watson (Chiwetel Ejiofor). The unexplained cases of gnomes going AWOL have coincided with the appearance of calling cards bearing the mark of Holmes’s nemesis Moriarty, who was believed to be dead after a recent altercation. Gnomeo and Juliet join the detective duo in order to bring their friends home. Sherlock Gnomes manages a consistent string of entertaining gags and imaginative set pieces. 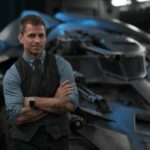 The narrative is as basic and schematic as it’s possible to be and the final revelations of the plot will be transparent to any adult brain within the first half an hour or so of the story. However, the visual style is bubblegum fun in the best sense of that phrase and there’s a procession of fun action sequences, helped by a script that has a sharp eye for a pun. A recurring motif in which Sherlock retreats into a black and white reimagining of the “mind palace” concept is a great slice of visual silliness. There are bum notes, with the characterisation of Moriarty as a pie mascot who was “manufactured evil” never quite coming together. The script also features some very dated gags about computer use, with an internet pop-up joke particularly sticking out like a sore thumb. It’s the sort of joke that would have felt dated when the first film came out in 2011, let alone today. The same is true of the returning Mankini Gnome, who should probably have also been confined to the original movie, when Borat wasn’t such a distant memory. 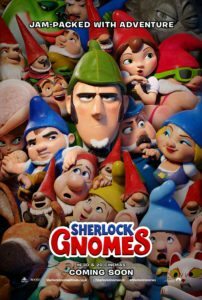 With that said, though, Sherlock Gnomes comes together better than any belated sequel to a mostly forgotten family movie probably should. It’s a raucous slice of Saturday morning cartoon silliness, helped by a supporting cast packed with ‘I-recognise-that-voice’ moments of excitement and a plot that is full of enjoyable adventure moments. This isn’t a Paddington 2 level burst of joy in the world of family films, but it’s a long way from Peter Rabbit too.